Why Banh xeo ba Duong (Madam Duong’s pancake) is special ? Banh Xeo Ba Duong is highly recommended for the best Banh Xeo in Da Nang city. In cold weather and rainy days, pancake restaurants are crowded with a group of friends and family being fond of the hot cake planes. Actually, enjoying oil and mix sizzling sound as pouring on a hot pan and awaiting with fragrant and crunchy cakes is memorable experiences. Sizzling cake is the best choice to miss empty stomach and warm the cockles of people’s hearts in the winter. Different from surrounding areas, the sauce is made with peanut, ground pork liver and seasoning; besides, this sauce is also used for the rice vermicelli with grilled pork. Especially, every restaurant selling sizzling cake also has the rice vermicelli with grilled pork. 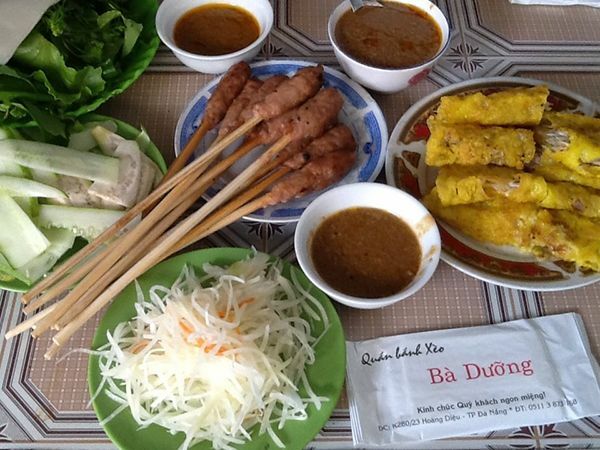 How to get to Banh xeo ba Duong (Madam Duong’s pancake)? Banh xeo Ba Duong is located at K280/23 Hoang Dieu Street. As it's in the end of the alley, you can ask the local for direction. Make sure you come for dinner after 6PM, otherwise it will be very hot. You don't wait for the waitresses to assist you. Find your own table and tell them how many people will eat and your preferred drinks. It's crowded and you have to be quick to snag a table and catch a waiter's attention. You should drop in here if you want to eat like a local, with the locals. First night in Danang and was bucketing down but my partner researched and found Ba Duong, so hotel said yes taxi will take you there. Anyway arrived and driver pointed us down the path which was narrow fitting pedestrians and motor bikes, and we reluctantly walked down and hoped for the best. With being not many people, suddenly this place was just filled with tiny tables and stools full with locals. Not one word of English was exchanged but food was just placed onto our table - crackling fried rice flour crepe filled with bean sprouts, shrimp, spring onions, and mung beans; skewers and rice paper to wrap and way you go for the night! We didn't get a drink because there was no menu and we didn't know what was available for most people ask for this bottle which looked like yogurt or dairy looking drink which we didn't really feel like but maybe it was the best match for this meal?! Very tasty banh xeo served with nice pork sticks for less than $2 per person. The place is kind of hidden in a small side street and is popular among locals.